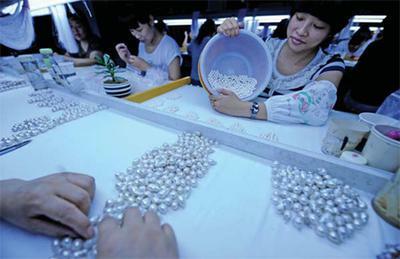 Zhuji's freshwater pearl output accounts for 73 percent of the world's total. Some of He Genmu's detractors once regarded him as crazy. If he had heeded their views, Zhuji city might have remained a small textile-manufacturing outpost barely distinguishable from many others like it in the eastern province of Zhejiang. But He soldiered on, and now, Zhuji, an hour's drive from the provincial capital, Hangzhou, is widely called the Pearl Capital. In the 1970s He was the first person in Zhuji to experiment with the techniques of breeding freshwater pearls. "Adding transport costs to that, the profitability was highly limited." In 1985 a pearl market was set up in Shangxiahu. It sells original pearls and mussels and is considered the genesis of Zhuji as a distributor of freshwater pearls. "When I first came to this place in 1987 it took me more than six hours to get here from Hangzhou airport," Lin Xianfu says. "At the end of a dusty road, groups of pearl farmers were carrying their pearls in plastic bags for sale, and the trade was done in the open air." Lin was among the first businessmen to deal in Zhuji pearls, and he is now executive director of China Pearls and Jewelry International City there. The market, set up in 2008, comprises 168,000 square meters of exhibition space, and more than 1,200 companies, foreign and domestic, have shops there. Last year the value of trade at the market totaled 7 billion yuan, and Lin predicts the figure will be more than 10 billion yuan this year. More about Zhuji, China - Cultured Freshwater Pearl Capital here.